Note: Even in the vacuum of space, the combat saucers were the most agile ship in existence at the time, but that’s not saying much, really. If this battle had taken place in an atmosphere, the saucer would have dodged the Whitehall’s desperate maneuver with ease, but Io only has a very slight volcanic atmosphere, depending on the season, and even that gets destroyed every couple of earth-days, when the world passes through Jupiter’s shadow. 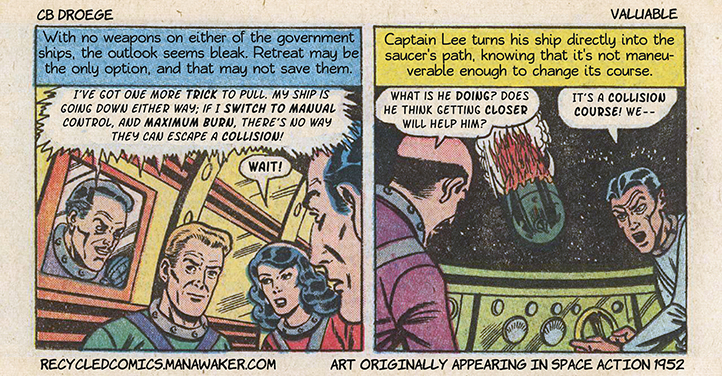 Captain Farrad Lee trained aboard a combat saucer as a cadet, before the program was scrapped, and knew the capabilities–and limitations–of those ships.